Vous pouvez également utiliser 17600 Kobo Super Points pour l'obtenir ! Linguist, psychoanalyst, and cultural theorist, Julia Kristeva is one of the most influential and prolific thinkers of our time. Her writings have broken new ground in the study of the self, the mind, and the ways in which we communicate through language. Her work is unique in that it skillfully brings together psychoanalytic theory and clinical practice, literature, linguistics, and philosophy. In her latest book on the powers and limits of psychoanalysis, Kristeva focuses on an intriguing new dilemma. Freud and psychoanalysis taught us that rebellion is what guarantees our independence and our creative abilities. But in our contemporary "entertainment" culture, is rebellion still a viable option? Is it still possible to build and embrace a counterculture? For whom—and against what—and under what forms? Kristeva illustrates the advances and impasses of rebel culture through the experiences of three twentieth-century writers: the existentialist John Paul Sartre, the surrealist Louis Aragon, and the theorist Roland Barthes. For Kristeva the rebellions championed by these figures—especially the political and seemingly dogmatic political commitments of Aragon and Sartre—strike the post-Cold War reader with a mixture of fascination and rejection. These theorists, according to Kristeva, are involved in a revolution against accepted notions of identity—of one's relation to others. Kristeva places their accomplishments in the context of other revolutionary movements in art, literature, and politics. 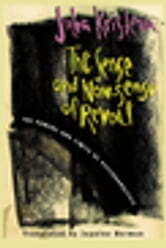 The book also offers an illuminating discussion of Freud's groundbreaking work on rebellion, focusing on the symbolic function of patricide in his Totem and Taboo and discussing his often neglected vision of language, and underscoring its complex connection to the revolutionary drive.